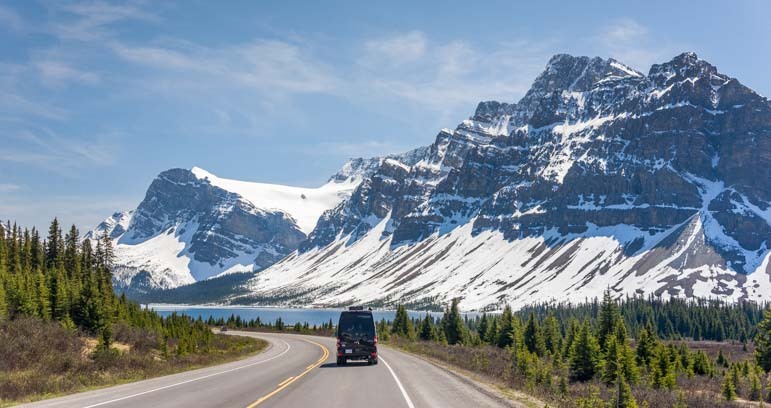 May 2016 – The Icefields Parkway weaves between towering mountain peaks through the Canadian Rockies in Banff and Jasper National Parks, offering up a new and utterly astonishing vista at every turn. 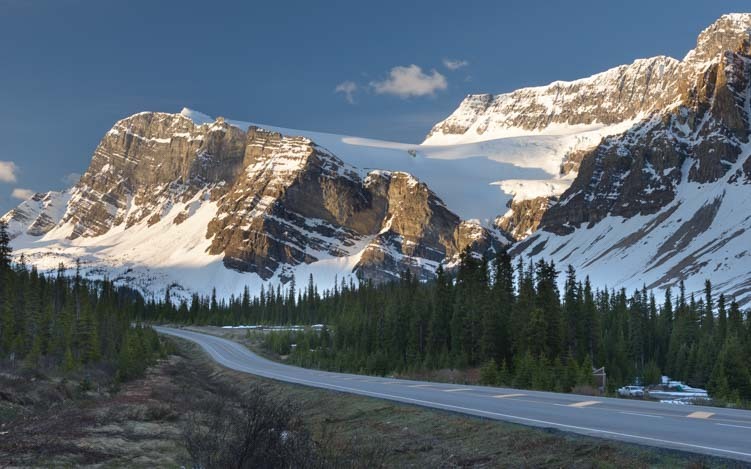 The Icefields Parkway takes you from one jaw-dropping view to another..for 150 miles! 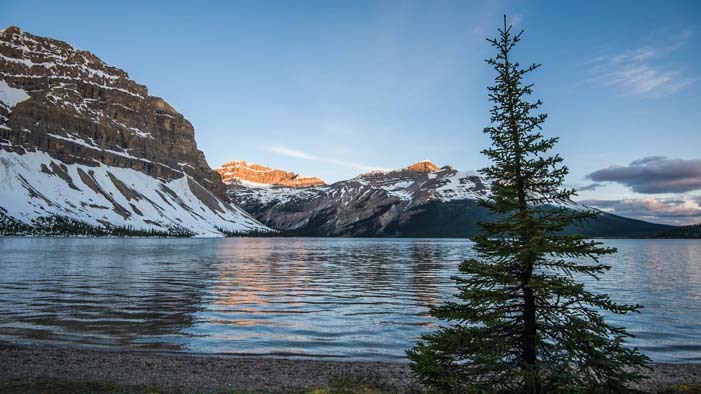 We wanted to catch the magic of Canada’s Rocky Mountains at dawn, and on a few mornings we hopped on the Icefields Parkway at the break of day to chase down down that magical moment. But it is hard to capture the soft pinks that fill the sky a half hour before sunrise when the sun crests the horizon at 5:30 a.m., as it does in this part of the world in late May, especially since it wasn’t getting totally dark until nearly 11 p.m. So much for sleeping! Morning on the Icefields Parkway. So, we didn’t quite make it before sunrise, but we still got the beautiful golden glow that spreads across the mountains as they wake up. 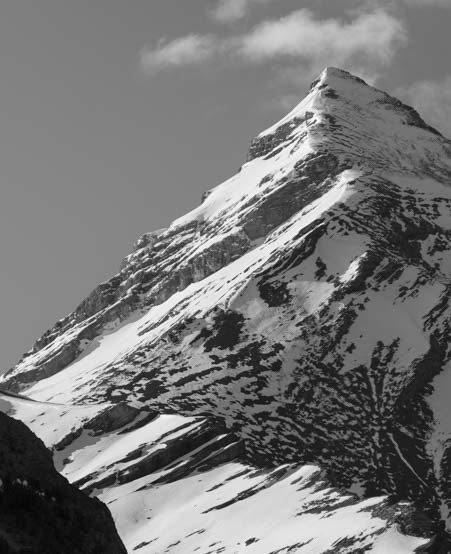 The snow was thick in certain spots up on the mountain peaks, and we loved the patterns the rock and snow made high above us. 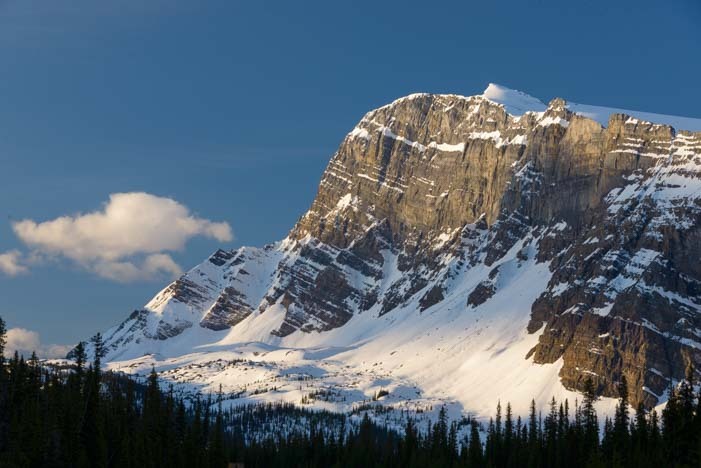 The tourist literature for the Icefields Parkway doesn’t wax poetic about any particular location. Their implied suggestion is simply that you should explore on your own and discover the most exquisite spots for yourself. Luckily, a friend had told us to make sure we didn’t miss Peyto Lake. 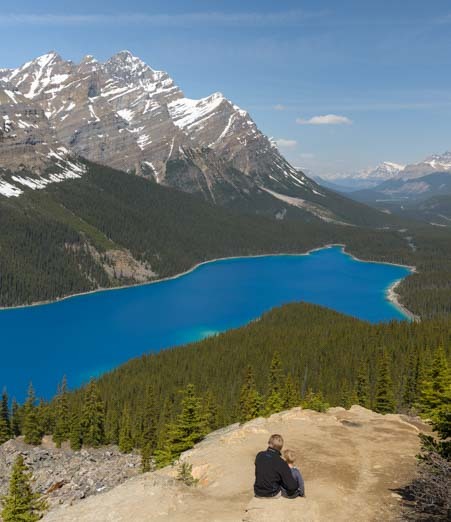 He hadn’t elaborated about why Peyto Lake was a “must see,” but as soon as we emerged from the short hiking trail to the viewing area that overlooks the lake, we knew exactly why he wanted us to go there. Peyto Lake comes into view. 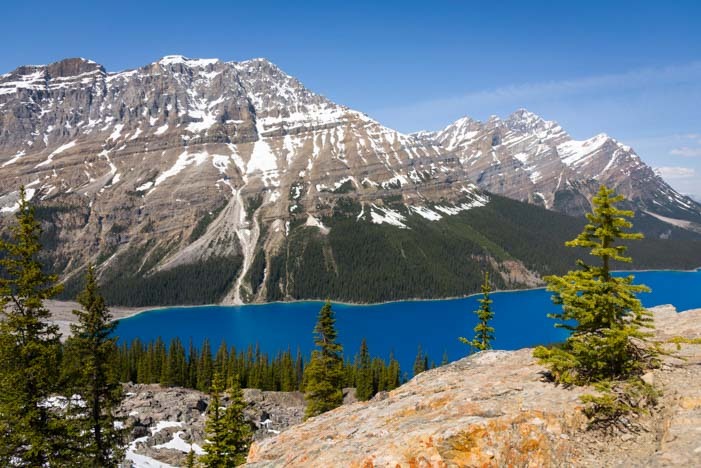 Is Peyto Lake really that blue? Yes! The small crowd on the viewing platform laughed. Every hiker that arrived had the same shocked look on their face as I did when they came upon the stunningly gorgeous view in front of them. The color of Peyto Lake was extraordinary. A group lined up for a selfie, and who wouldn’t? A dad took his son below the deck and sat with him for little while enjoying the view. What an unforgettable moment and priceless memory. A father and son take a moment to enjoy the view together. 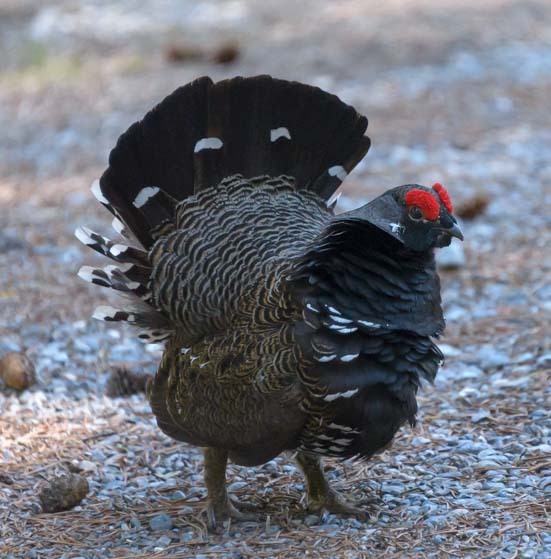 His wife was standing next to me at the overlook, and we chatted for a few moments. 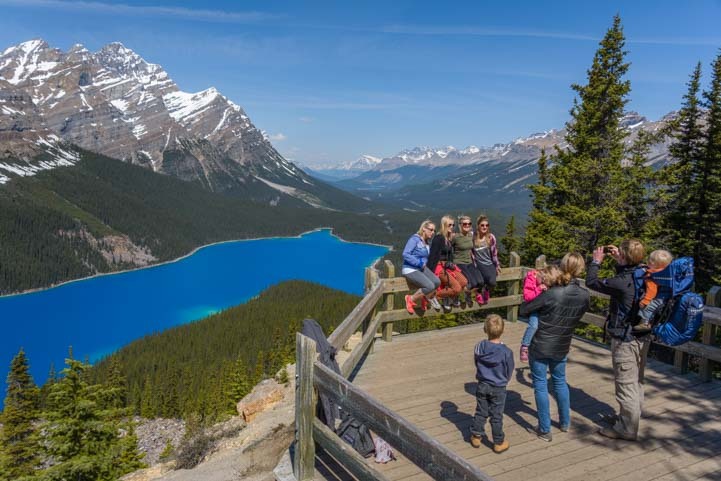 I discovered they were from Germany and they had visited Peyto Lake a week earlier when the mountains had been blanketed in snow. “It was all white — except for that blue,” she said, her hand sweeping across the painted landscape as she described what she had seen. 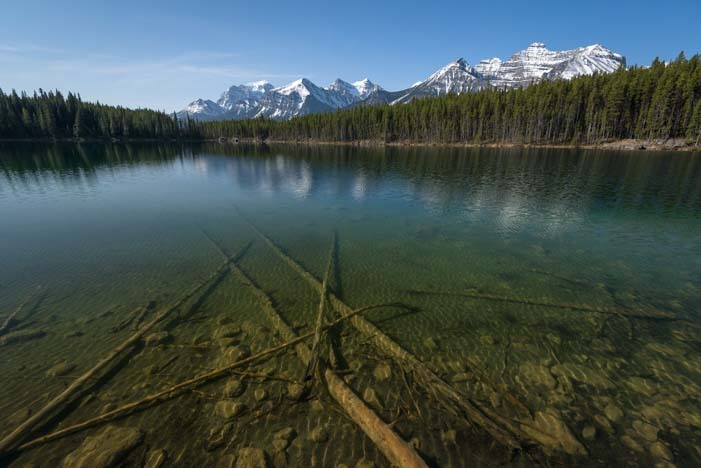 All of the rivers and lakes in the Canadian Rockies turn vivid green and blue in the sunlight, as long as the water isn’t too stirred up. The water is full of “glacial flour” which is crushed rock that the glaciers have ground down to a fine powder as they move. This crushed rock becomes suspended in the water and creates vivid blues and greens in the sunlight. 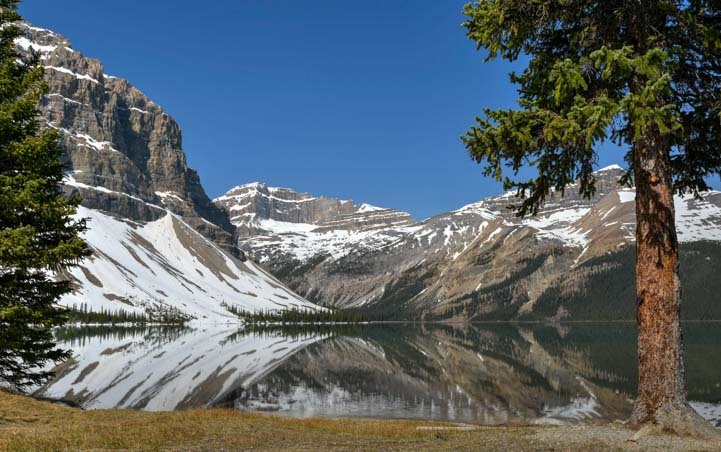 Another beautiful pair of lakes on the Icefields Parkway is the Waterfowl Lakes (Upper and Lower). Rather than royal blue, these lakes are turquoise colored like Lake Louise. 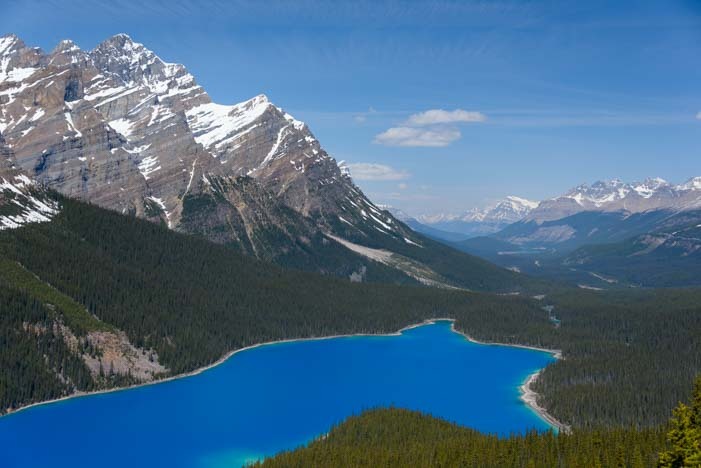 Unlike the true blue of Peyto Lake, the Waterfowl Lakes are turquoise! 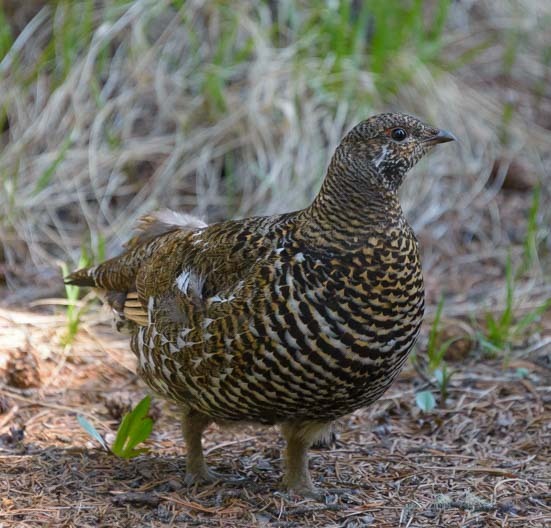 We didn’t see any waterfowl there, but as we were wandering around the shore, we came across a grouse. 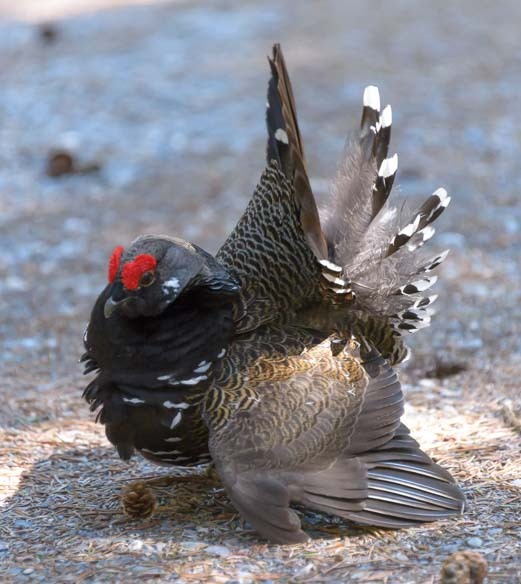 Down at our feet, Mark spotted a grouse! This bird noticed us, but she wasn’t too concerned. She was preoccupied with brushing off the amorous attentions of a her suitor who was walking around her in circles. This guy was pulling out all the stops for her. 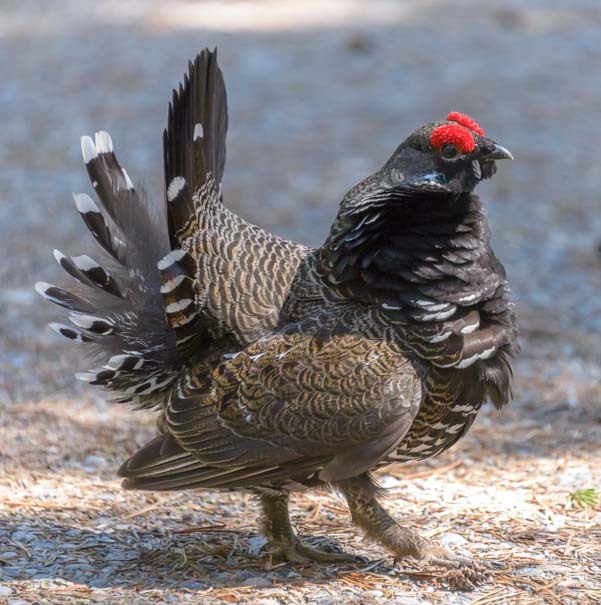 She wasn’t all that impressed, even though he was strutting his stuff for all he was worth, but I sure was! She was having none of it, but I thought his display was great! 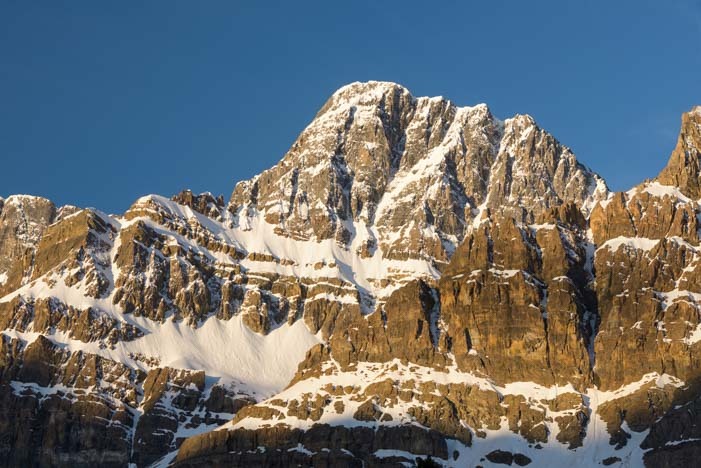 Back out on the Icefields Parkway, we continued to be blown away by the towering mountains and their snowy peaks. 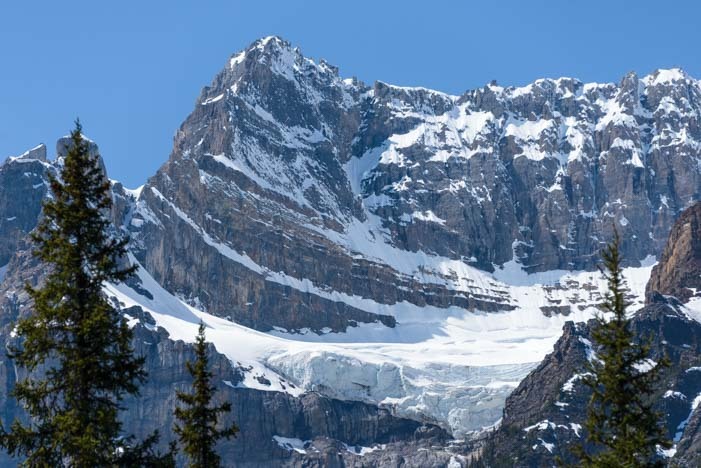 The scenery on the Icefields Parkway never gets boring! Occasionally, when we pulled over to admire the views, we could hear the thunderous sound of an avalanche high up in the mountains. Then we’d see the snow pouring down the crevices in the side of the mountain. 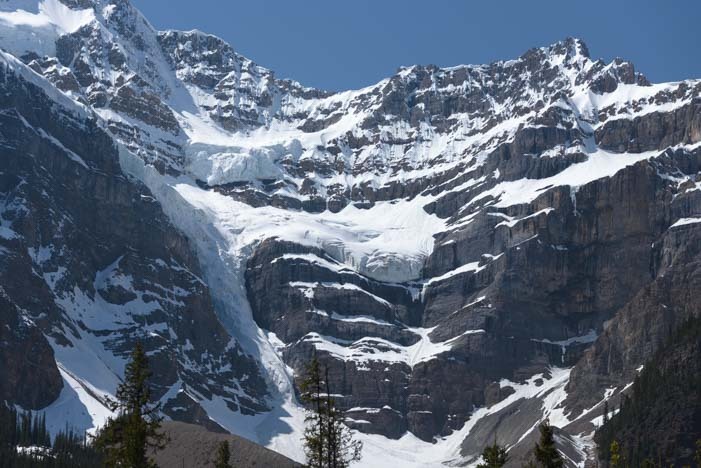 Avalanches are common as the snow melts in the spring. It was incredible just how loud these avalanches were, and equally incredible just how hard it was to spot where the avalanche was happening. They were way far up in the peaks, and they didn’t seem all that big from our vantage point on the ground. The loftiness of the mountains was awe-inspiring. And the clarity of lakes was too. 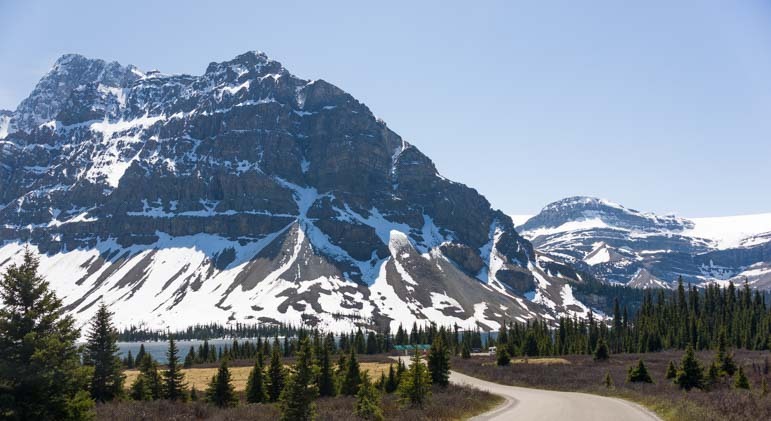 The Icefields Parkway is a fast moving thoroughfare between Lake Louise and Jasper, but we never got tired of driving it! Now THAT’s a scenic drive! 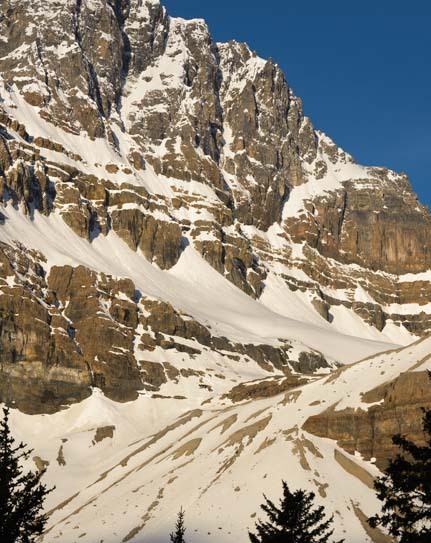 The village at the southern end of the Icefields Parkway, Lake Louise, makes a great “home base” for exploring the southern half of the Icefields Parkway. 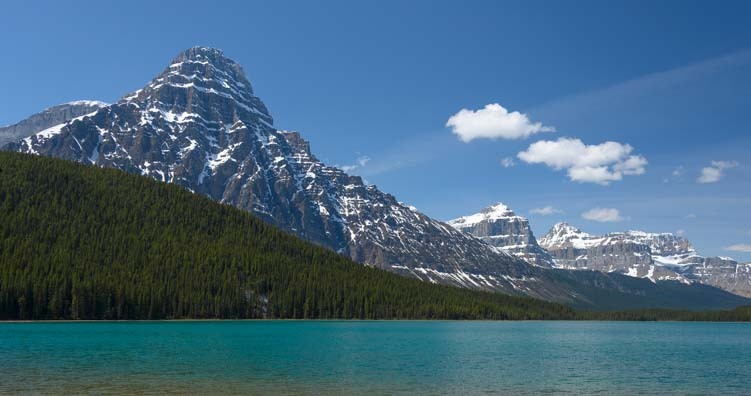 For more info, see this post: Lake Lousise – Heart of Banff National Park. 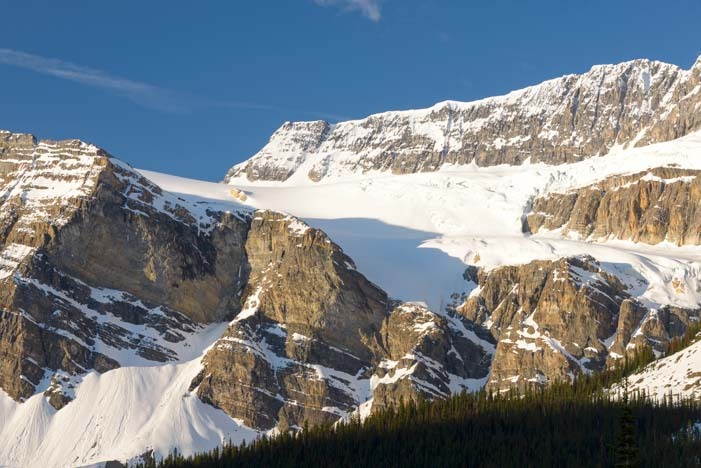 At the end of that post (and in the following link) there is info about RV camping at Lake Louise. Crater Lake National Park – Bluer Than Blue! Grenada – A Jewel in the Turquoise Water of the Caribbean! 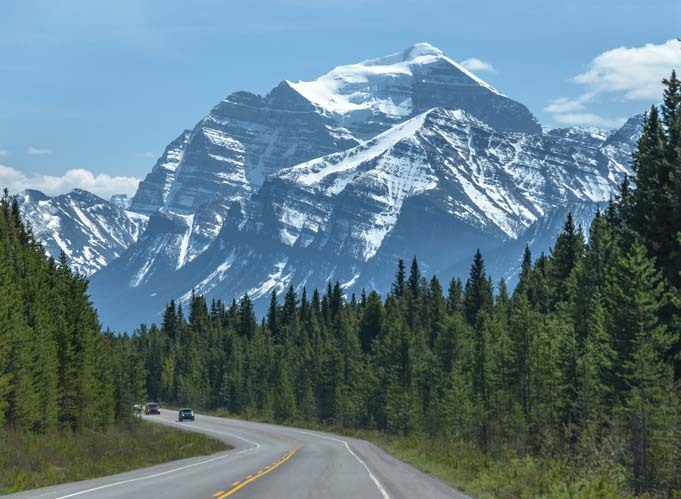 This entry was posted in Canada and tagged Canada, Canadian Rockies, National Parks Canada, New, Top Scenic Drives, Travel, WP Travel by Roads Less Traveled. Bookmark the permalink.